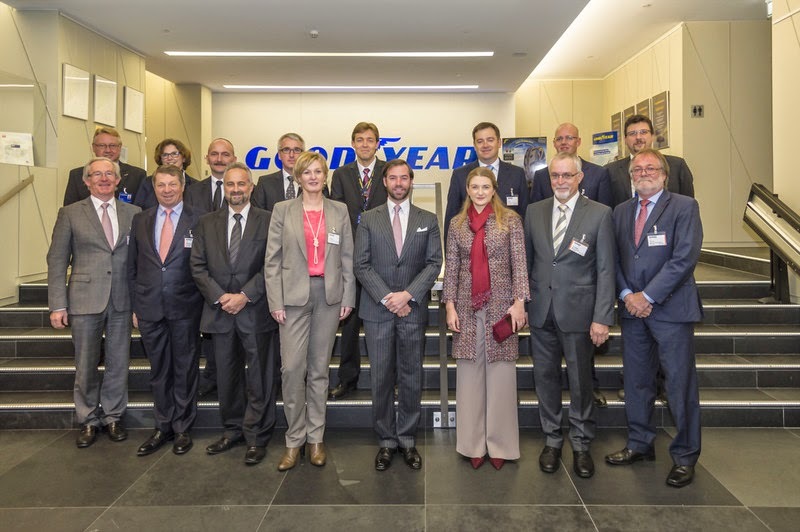 Today at 2:00, Hereditary Grand Duke Guillaume was in Colmar-Berg to visit the Goodyear facility. This event, part of a series of company visits, was organized by Fedil (Business Federation Luxembourg), a multi-sector federation of Luxembourg businesses that include business services, industrial, and construction companies. Fedil encompasses around 550 different businesses, of which the Goodyear factory in Colmar-Berg is one. The goal of this series of visits is for the Grand Ducal family to learn more about the companies that make up Fedil members. Photos posted on the Cour website, and it looks like Hereditary Grand Duchess Stéphanie accompanied Guillaume! Check out the link for more nice images of the visit.